I like this story because David is very confident. He doesn't have any fear of the giant Goliath. And our little David at CFPM has faced his Goliaths throughout his young life. It's no surprise this Bible account is an encouragement to him. 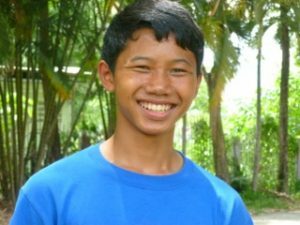 David used to live with his family in a village in Thailand. He lived with his grandmother and grandfather, aunt, uncle, and other relatives. They didn’t send David to school very often. He was used to working in the village more than studying. His mother is in prison in Thailand for 25 years. 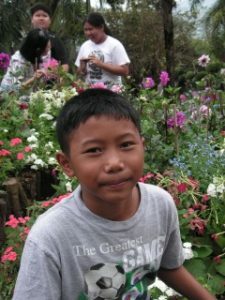 His father is Burmese and he cannot come to stay in Thailand. The father has a new wife in Myanmar as well. I get to have a warm family, good parents, and I have learned many experiences of life from the role models that God gave me through CFPM. And I have a lot of brothers and sisters. I am very thankful to God. At CFPM the children are taken care of physically, emotionally, and spiritually. And they are taught the gospel from the loving caretakers that work and live there. This is an opportunity they may not otherwise have had and we praise God for the way He works mightily in these kids' lives. Will you pray with us that God continues to work by bringing more kids to CFPM and saving them through His Word?